From now through October 28th, you have the opportunity to join the world’s largest global e-Book club through Overdrive’s Big Library Read. The title for this round is ANATOMY OF A MISFIT by Andrea Portes, and for the next two weeks you can borrow the eBook or eAudiobook without any waitlists or holds. In this Mean Girls meets The Perks of Being a Wallflower tale, narrator Anika Dragomir is the third most popular girl at PoundHigh School. But inside, she knows she’s a freak; she can’t stop thinking about former loner Logan McDonough, who showed up on the first day of tenth grade hotter, bolder, and more mysterious than ever. Logan is fascinating, troubled and off-limits. The Pound High queen bee will make Anika’s life hell if she’s seen with him. So Anika must choose–ignore her feelings and keep her social status? Or follow her heart and risk becoming a pariah. Which will she pick? And what will she think of her choice when an unimaginable tragedy strikes, changing her forever? An absolutely original new voice in YA in a story that will start important conversations–and tear at your heart. ANATOMY OF A MISFIT is based on Andrea Portes’ real-life experiences as a teenager. She will be profiled as a Face of Courage in September for Moms Demand Action, the group lobbying for gun sense reform. If you do read the book, be sure to share your thoughts on Twitter using the hashtag #BigLibraryRead. If you have any questions for Andrea, you can also ask them via Twitter using this hashtag. On October 20th Overdrive will post an exclusive interview with the author where these questions (and many others) will be answered. If you’re new to Twitter and would like some help getting started, we have some books on the subject to have a look at. You can also give us a shout! We’re always happy to lend a hand. We’ll also have a chat taking place within our Online Book Club for anybody who would like to chime in there. The Big Library Read program is made possible through a partnership between OverDrive, the leading supplier of eBooks and more to libraries, and HarperCollins, publisher of Andrea Portes’ latest title. 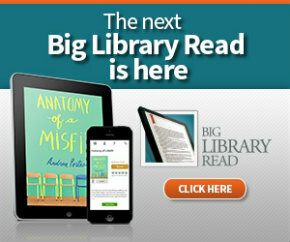 You can learn more about Big Library Read and past selections here. We look forward to hearing from you! Happy Reading.